Lincoln Northeast senior Mohamed Muhammed has taken a hands-on approach to learning and preparing himself for the life after he wears his cap and gown this May. After completing all offered Automotive Technology courses at Lincoln Northeast high school, Muhammed changed direction a bit and enrolled in the Residential Construction course. While participating in the construction course he found himself desiring to absorb additional knowledge and experience in the construction field. “I wanted to learn really how everything goes together in a house,” commented Muhammed. This lead him to the Bryant Trades Pilot Program, a program in just it’s second year and currently only offered to Lincoln Northeast High School students in conjunction with Bryant Air Conditioning, Heating, Electrical, Plumbing Sheetmetal & Service Company. 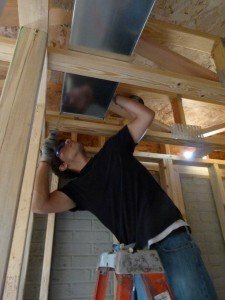 Muhammed began the work component, the final stage of the trades pilot program, in the sheet metal shop learning sheetmetal basics and ductwork construction. As he progressed, he worked alongside skilled technicians on residential new construction jobs. During this time Muhammed was exposed to a wide range of experiences from roughing-in ductwork and venting to the installation of the heating and cooling equipment. In the programs short history, Bryant has first hand evaluated and hired talented students. Recently Muhammed’s name was added to the list of hired trades students when his supervisor Brian Kassebaum offered him a full-time position. “Mohammad is a quick learner and pays attention to detail, these traits are critical,” explained Kassebaum.